Egyptian media are reporting that a Dutch journalist was raped by several men in Cairo's Tahrir Square on Friday. According to a post from Sunday on the Facebook page of Dina Zakaria, an Egyptian journalist, "her condition is severe and she is hospitalized." Ynetnews reports today that a state hospital issued a statement that the woman was admitted after being raped by five men. She has since undergone surgery and been released from the facility. This attack is truly devastating, and, sadly, it's hardly far from the norm. A report by the UN finds that over 99 percent of Egyptian women have experienced some form of sexual harassment or assault in their life. 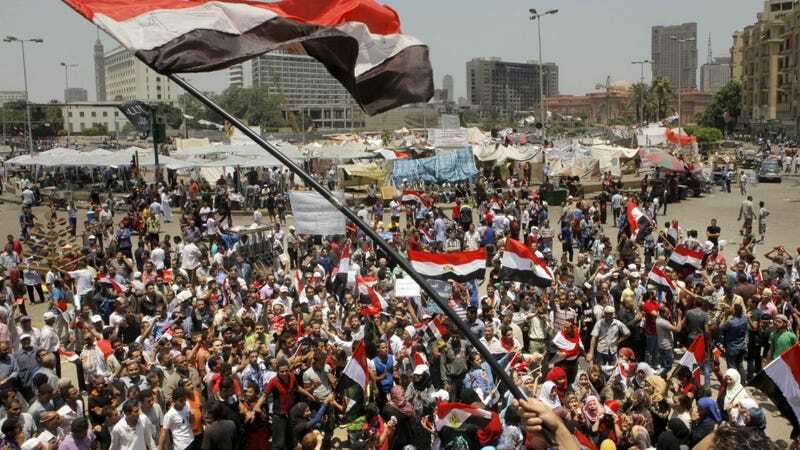 According to Ahram Online, Operation Anti-Sexual Harassment (an Egyptian women's group) reported forty-six separate sexual assaults during this round of anti-Morsi protests in Tahrir Square. On Sunday night, grassroots anti-harassment groups urged women to stay away from the area altogether: "The area is not safe and we recommend leaving, if possible," tweeted Tahrir Bodyguard. Operation Anti-Sexual Harassment reports that men armed with sticks were standing by the entrance to the Tahrir metro station, attacking women. Presidential spokesperson Ehab Fahmy held a press conference on Sunday in which he directly addressed the rampant sexual harassment and sexual violence that plague the protests. According to Daily News Egypt, Fahmy said that "any Egyptian condemns these shameful acts" and added that such vile behvaior was not characteristic of the Egyptian people. He also stated that the presidency has taken action in order to bring the Dutch journalist's attackers to justice (although it is doubtful how effective these measures will be): "We informed the Ministry of the Interior to immediately take necessary measures and catch the assailants." According to the Huffington Post, Egypt's Prosecutor General Talaat Abdallah sent staff to the hospital to take the woman's testimony.